life in my studio: Having a Great Day! Well, I'm feeling alot better today! In fact, I'm feeling so much better, that I showered, dressed, and left the house! I went to Michael's to stock up on some cute, cute flowers for scrapbooking, and to pick up a few fall flowers so I can start adding some fall touches to the house. I just LOVE fall!! Then I got my grocery shopping done. I hadn't been for awhile, so it was a BIG haul! Then, this afternoon, I found a new blog called be yourself: live with passion. 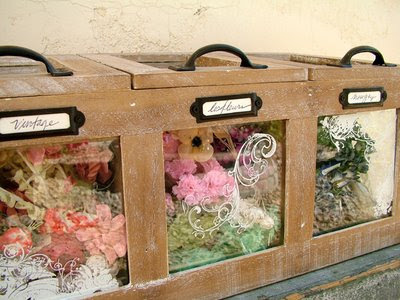 And look what she has for storing her flowers. It's so cute, I just about peed my pants!!! I had to have it! So, thanks to the link on her site, I went here and ordered it! Can't wait to get it! Every day lived well makes yesterday a fond remembrance and every tomorrow a dream of hope. Glad that you're feeling better. The only good thing about being sick is GETTING WELL! I enjoy your colorful pics. Those flowers must have cheered you up!